This is the new cd to tie in with Halloween II. Rob once again creates a fictional band that is really Austin, TX guitar slinger Jesse Dayton doing the music. 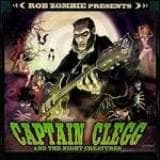 He first did it with Banjo and Sullivan for Devils Rejects and does it again for Halloween II with Captain Clegg and the Night Creatures.